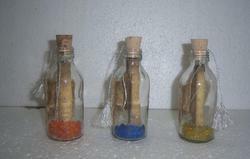 Leading Exporter of custom made empty bottles with cork for gifting and empty bottles in glass from Mumbai. We supply a large range of Empty Bottles for Wedding Invitation Designer for making Glass Bottle Invites. Our Empty Glass Bottles are available in a large assortment of sizes. Looking for Empty Glass Bottles for Wedding Invites ?